So, here in Vermont, an inland New England state, we found ourselves under a hurricane watch, then a tropical storm watch, for 24 hours this past weekend. Now, I’m used to being snowbound for 24-48 hours during a blizzard, but the end of August? I don’t want to waste a summer weekend day inside, I have things I want to do outside! But alas I was stuck with nothing to do but read, write, watch movies, cook, and eat. Hence, this latest soup. I was lucky enough to snag a small head of organic cauliflower a couple of weeks ago in the “reduced produce” bin at the co-op for 49 cents! Unheard of! I love cauliflower, and organic usually runs in the range of $3.50-plus, so I was thrilled. I didn’t pay any attention to the fact that it was 80 degrees outside; I usually roast it in the oven with a little olive oil, but despite the heat, I knew I’d find some use for it. I have fond memories of the fondue phase of the 1970s, especially cheese fondue. What’s not to love about melted cheese with wine, spices, and dipped bread pieces? I wanted to recreate that in a soup, yet in a healthier manner without cream or butter. Plus, I wanted to have a soup to heat up for dinner in case we lost power. I finely minced two garlic cloves and about ¼ cup red onion together and put them in a pot with 2 teaspoons of warmed extra virgin olive oil. I should warn you that cooking garlic and onions early on a Sunday morning may not be the most welcoming of scents to wake to, but the blueberry pancakes made up for that later on. 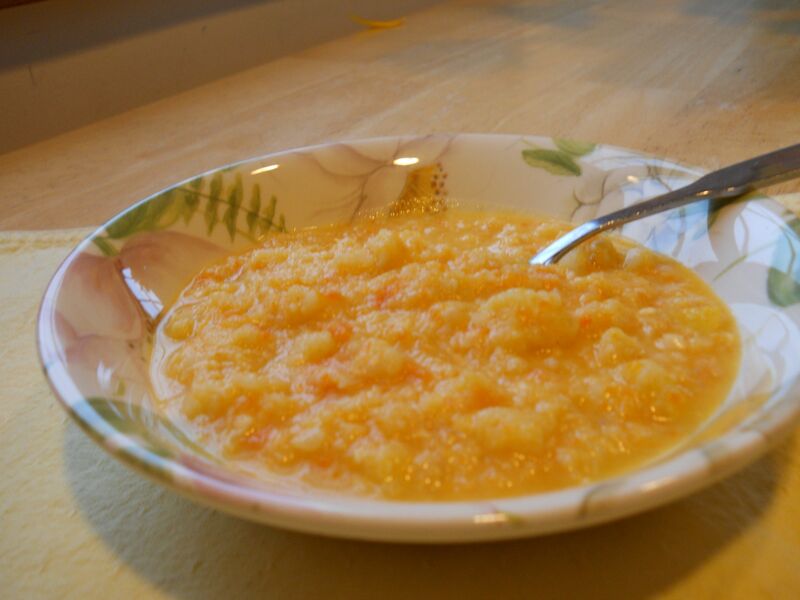 After they were good and soft, I added two diced carrots as well as a diced yellow squash. Not a lot of flavor in the squash, but it’s a watery and colorful vegetable, and would add both to the soup. Then I added the chopped cauliflower. No worries about dicing or chopping things just so, this was going to be blended, so small pieces are best. Once everything became soft, I added about 3 cups of chicken stock or broth (for a vegetarian meal, you can use vegetable broth or water), a couple glugs of white wine, and I let the veggies poach in the liquid at very low heat until they became extra soft. My goal was to use a potato masher so this could be a one-pot dish and I wouldn’t have the blender to clean, but that didn’t work out. Mashing the veggies just made them, well, mashed, instead of pureed. So I pulled out the blender, ladled two scoops of soup, pureed, and repeated until it was basically smooth with just a few small bits of vegetables here and there. Now it was the consistency of wallpaper paste, so adding about ¼-½ cup of water thinned it out. A little more than a cup of grated extra sharp cheddar cheese was added and melted in the soup, a scant ¼ teaspoon of cayenne pepper, and salt and pepper to taste, and lunch was ready! A yellowish-orange hued soup with some warm bread for lunch was just the ticket to wile away an afternoon of wind and rain. The movie was “Funny Girl,” one of my all-time favorite musicals, and the electricity went off just when Omar Sharif was to propose to Barbra Streisand, but luckily it returned two seconds later. Just as I finished cleaning up the kitchen following dinner, it went out again, for good, until morning. Early Monday, the sky was an eerie pinkish color, no rain or wind, no chirping birds, but all was right in my world once again. In a stockpot, heat the olive oil until warm. Add the garlic and onion and cook until soft, just a couple of minutes. Add the carrots and squash, stir, and cook until soft. Add the cauliflower, and cook until soft. Add the chicken stock, wine, and cook at very low heat until the vegetables are so soft they are almost mushy. In a blender, take two ladles full of soup and blend until soft. Repeat until the soup is completely pureed. If needed, add a little water to thin it out. Melt the cheese in the soup and add the cayenne, salt, and pepper. Serve warm.